Congratulations on the mandate that you received from the voters in Ontario to lead this great province! We are keen to work with you and your team. Together we can make Ontario a great place to live, to work, to do business, and to produce greenhouse crops! We believe that the policy goals and outcomes you have outlined are well aligned with the needs of our sector. We stand ready to support your agenda in achieving the government’s goals. We are ready to provide constructive input into policy decision-making and work as partners on sustainable solutions that enhance the competitiveness of Ontario greenhouse farmers. Our sector of agriculture uses advanced technology to achieve many multiples of productivity beyond what is possible with field agriculture and provide fresh products to Ontario year-round. We are also major exporters to the US market contributing to Ontario’s trade balance. We look forward to showcasing our sector to you and your team. Ontario’s greenhouse sector leaders applauded the announcement made yesterday* by Hon. Jeff Leal, Ontario’s Minister of Agriculture, Food and Rural Affairs, of Ontario’s investment in the Ontario greenhouse sector’s productivity and innovation. TOGA is the Ontario organization that represents over 400 Ontario greenhouse growers through its two members. The greenhouse sector of Ontario agriculture has a farmgate value in excess of $1.6 billion, employs over 20,000 workers, and exports over $1 billion. 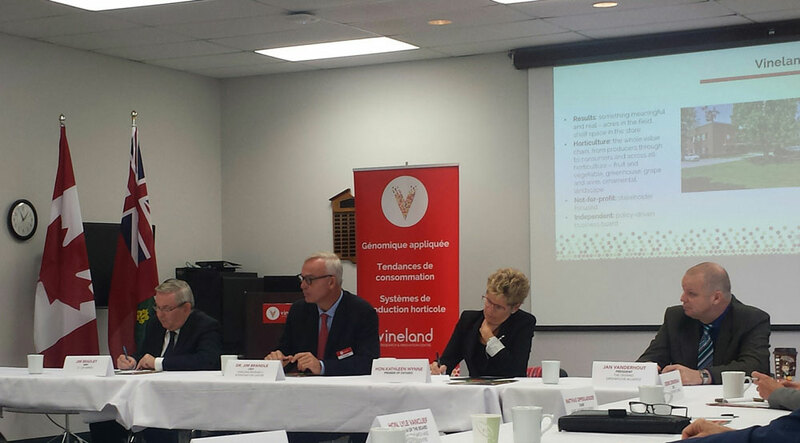 TOGA’s Chair, Jan Vanderhout, was a participant in the Premier’s Stakeholder Round Table held for horticultural sector representatives at Vineland Research and Innovation Centre on October 11, 2016. From left to right: Hon. Jim Bradley, MPP for St. Catharines; Dr. Jim Brandle, CEO, Vineland Research and Innovation Centre; Premier Wynne; and TOGA’s Chair, Jan Vanderhout. TOGA’s two members were represented at the session by George Gilvesy, Chair, Ontario Greenhouse Vegetable Growers and Andrew Morse, Executive Director, Flowers Canada (Ontario). TOGA appreciates Vineland’s including the greenhouse sector in the Session. 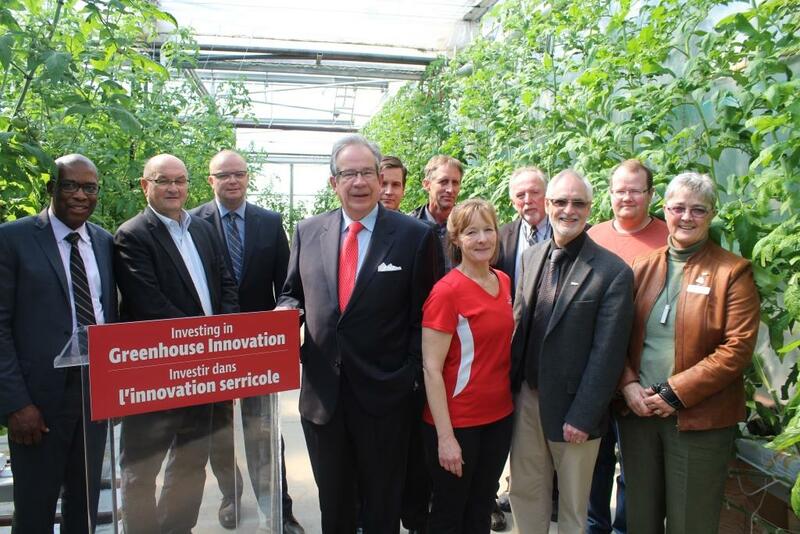 Leamington – Ontario’s 2015 budget included good news for Ontario’s greenhouse sector. “News that the government is pursuing expansion of natural gas infrastructure in the province is important for our sector”, said Jan Vanderhout, Chair of the Ontario Greenhouse Alliance. “Our greenhouse farms are proof of the return these investments can yield in job creation and economic growth. However this is just a start. We will need to make sure that the details of these programs enable the province to maximizing the returns for taxpayers’ investment”. In order to continue to support a growing greenhouse sector, Vanderhout stated, “The government needs to consider both under-serviced as well as un-serviced areas of the province as part of its plan to utilize natural gas infrastructure as an engine of growth.” Many greenhouse operations have access to natural gas now but not at the level needed for reliable supply throughout the winter months. The infrastructure serving these operations needs to be upgraded and expanded. “We look forward to working with the Ontario government to collaboratively address challenges to keep us globally competitive. Our greenhouse farms continue to invest and grow. The government can support us with its “open for business” commitment,” said Vanderhout. TOGA represents Ontario’s greenhouse growers through its member organizations, the Ontario Greenhouse Vegetable Growers and Flowers Canada (Ontario). This week the Ontario Government announced the new “Greenhouse Nutrient Feedwater Regulation” under the Nutrient Management Act. The development of this new regulation is an example of the positive outcome that results when sector representatives and government ministries collaborate. This process was facilitated through the Ontario Greenhouse Environmental Strategy (OGES) task force. The task force representatives are drawn from the greenhouse sector, the Ontario Ministry of Agriculture, Food and Rural Affairs (OMAFRA) and the Ministry of the Environment and Climate Change (MOECC). The common goal was to develop and implement a streamlined solution that is protective of the environment and cost effective for the sector. The new Greenhouse Nutrient Feedwater Regulation will help greenhouse growers better comply with environmental standards by reducing the costs and uncertainty of approvals. It will promote reuse and facilitate the recycling of greenhouse nutrient feedwater while providing farmers with a new source of irrigation water and nutrients for their field crops. Jan VanderHout , a greenhouse vegetable producer and Chair of The Ontario Greenhouse Alliance (TOGA), a $1.4 billion annual economic engine in rural Ontario, welcomed the provincial government's announcement of a new combined heat and power (CHP) program targeting greenhouse operations, agri-food and district energy. The commitment was made in the Ministry of Energy's Long Term Energy Plan released on Monday, December 2nd. The TOGA Chair said, "This announcement is a positive step forward for Ontario's economy and environment by contributing to the recovery of carbon dioxide and heat, both co-products from the generation of electricity from natural gas, and directing them into beneficial uses in greenhouse operations." >VanderHout said TOGA looks forward to working with the government on CHP and a number of other energy and conservation initiatives that will contribute to a healthier economy and environment and continue Ontario's leadership in greenhouse agriculture.